Mulberry is an open source email client which was originally developed for Mac system but later on devised also for Windows platform. Mulberry strictly sticks to the required standardization. It impeccably supports different internet protocols like LDAP, IMAP, IMSP, ACAP and iCalendar. With iCalendar, a user can deal with multiple languages as it is equipped with advanced filters and perfectly supports IMAP disconnected problems. However, many users still prefer Outlook platform over Mulberry for emailing and calendaring events. It might an individual’s personal decision or need of the time for the organization to maintain communication. The situation becomes bit tricky when the current platform used by the user is Mulberry and user wishes to migrate to Outlook platform. Number of users prefer MS Outlook and unfortunately MBOX file is not supported by the MS Outlook. 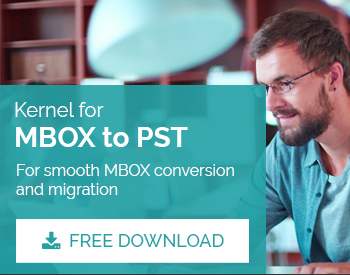 To perform flawless migration from Mulberry to PST (Outlook), the assistance from external agency like Kernel for MBOX to PST is highly recommended. 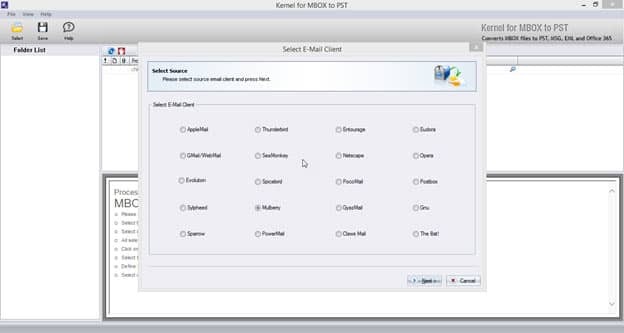 Install the Kernel for MBOX to PST software and select ‘Mulberry’ as MBOX platform among other options. 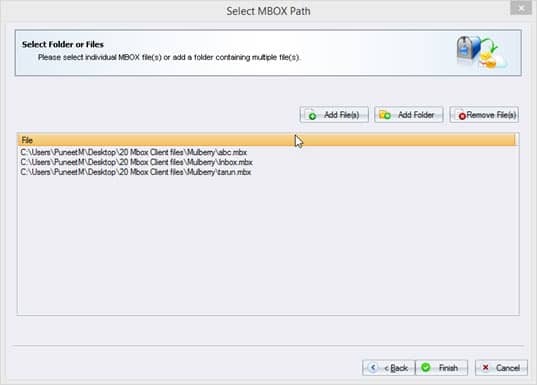 Click ‘Next’ to proceed to add the Mulberry MBOX files using ‘Add File(s)’. In case, you want to remove any file that got selected by default, just click ‘Remove File(s)’. On addition of required MBOX files click ‘Finish’. 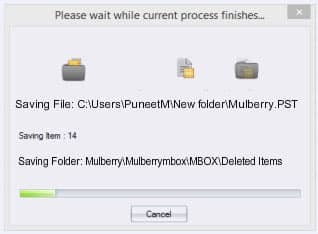 A new window with detailed information on concerned Mulberry MBOX files will appear. To save them, click ‘Save’ icon located at the top of the tool’s interface. A new window with different conversion options will appear. 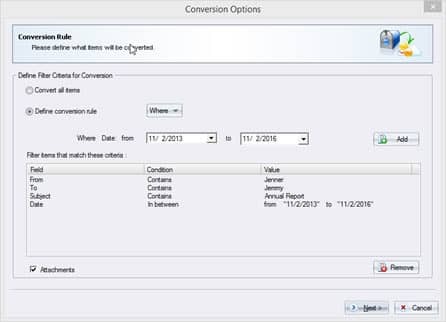 It provides two conversion options: ‘Convert all items’ and ‘Define Conversion Rule’. 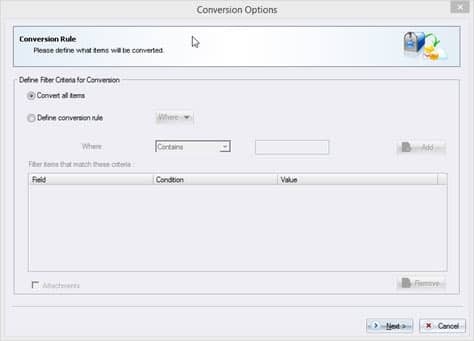 To directly convert all items simply click ‘Convert all items’ and hit ‘Next’. To save the Mulberry MBOX files on the basis of some specified entries, then select ‘Define Conversion Rule’. It provides different fields like From, To, Subject and Date categorized under the ‘Where’ section. Provide a value contained or not contained in the “To” field. Finally, state the date range using “date” field. Click ‘Next’ to proceed it to saving options. Select ‘Save in PST’ to migrate and save the selective items into the PST file format. You may also select from the other options: ‘Save in EML’, ‘Save in MSG’ and ‘Save in Office 365’. 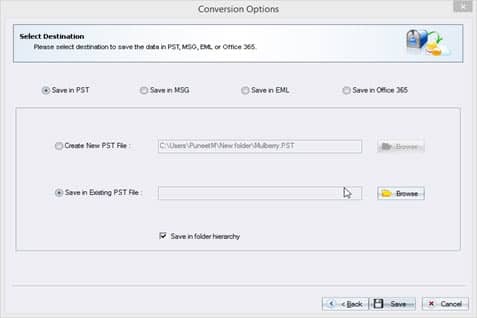 Click ‘Create New PST File’ to save the file in a new PST file. Click ‘Browse’ to proceed to create the PST file. Once done, the destination path will be automatically created. 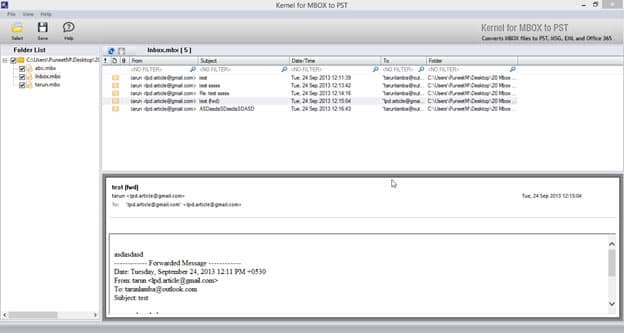 Click ‘Browse’ to provide the location of the pre-existing PST file. Once done the interface will display the message of successful completion of required MBOX to PST conversion.